Background: Natural Orifice Transluminal Endoscopic Surgery (NOTES) is evolving as a surgical modalitybut requires more outcome data and elucidation of technical challenges. Simulation training has reached the forefront of surgical education and has also been applied to emerging techniques. Training as part of teams is an important component of simulation. With NOTES, new interactions between members of teams such as endoscopists and surgeons, and merging of endoscopic and laparoscopic surgical crews, introduces potential conflicts and barriers to efficient patient care. 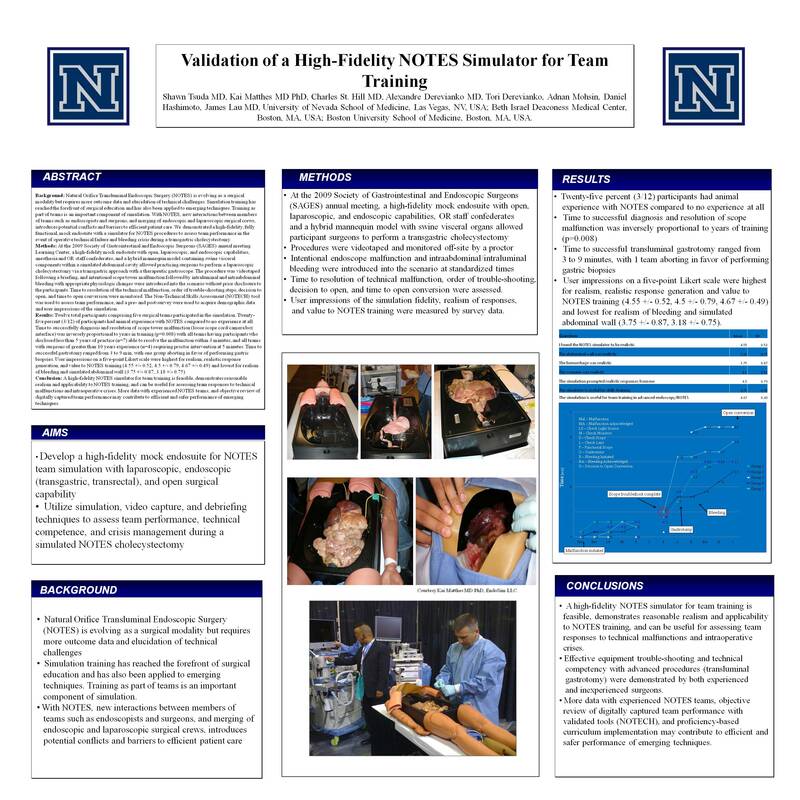 We demonstrated a high-fidelity, fully functional, mock endosuite with a simulator for NOTES procedures to assess team performance in the event of operative technical failure and bleeding crisis during a transgastric cholecystectomy. Methods: At the 2009 Society of American Gastrointestinal and Endoscopic Surgeons (SAGES) Annual Meeting Learning Center, a high-fidelity mock endosuite with open, laparoscopic, and endoscopic capabilities, anesthesia and OR staff confederates, and a hybrid mannequin model containing swine visceral components within a simulated abdominal cavity allowed practicing surgeons to perform a laparoscopic cholecystectomy via a transgastric approach with a therapeutic gastroscope. The procedure was videotaped following a briefing, and intentional scope tower malfunction followed by intraluminal and intraabdominal bleeding with appropriate physiologic changes were introduced into the scenario without prior disclosure to the participants. Time to resolution of the technical malfunction, order of trouble-shooting steps, decision to open, and time to open conversion were monitored. The Non-Technical Skills Assessment (NOTECH) tool was used to assess team performance, and a pre- and post-survey were used to acquire demographic data and user impressions of the simulation. Results: Twelve total participants comprising five surgical teams participated in the simulation. Twenty-five percent (3/12) of participants had animal experience with NOTES compared to no experience at all. Time to successfully diagnosis and resolution of scope tower malfunction (loose scope cord/camera box interface) was inversely proportional to years in training (p=0.008) with all teams having participants who disclosed less than 5 years of practice (n=7) able to resolve the malfunction within 3 minutes, and all teams with surgeons of greater than 10 years experience (n=4) requiring proctor intervention at 5 minutes. Time to successful gastrotomy ranged from 3 to 9 min, with one group aborting in favor of performing gastric biopsies. User impressions on a five-point Likert scale were highest for realism, realistic response generation, and value to NOTES training (4.55 ± 0.52, 4.5 ± 0.79, 4.67 ± 0.49) and lowest for realism of bleeding and simulated abdominal wall (3.75 ± 0.87, 3.18 ± 0.75). Conclusion: A high-fidelity NOTES simulator for team training is feasible, demonstrates reasonable realism and applicability to NOTES training, and can be useful for assessing team responses to technical malfunctions and intraoperative crises. More data with experienced NOTES teams, and objective review of digitally captured team performance may contribute to efficient and safer performance of emerging techniques.